There are several ways to implement menu systems in a program. You could have a series of command buttons where the user clicks the button that represents their choice. Users could be required to type a number into a text box to access their selected task. Visual Basic programs are based on forms which, like all windows, tend to have their menus as clickable text just below the title bar. We will have to start by making a program with enough options to make a menu a worthwhile addition to the program. Our program will help a web designer to create HTML instructions quickly. HTML files are text files. To make text display a particular way, designers use tags to instruct the browser as to how the text should be displayed. For example, <b>My Text</b> makes My Text appear in bold. We want to make our program so that the user can highlight a few words, click on the relevant menu and have the instructions placed around the text we want to format. Start a new project and do the following things. Name the form, frmMain and set its caption to Mini HTML Editor. Add a text box which fills the form. Set its text property to nothing and the multiline property to true.. Name the text box, txtHTML. Save Your Work and check that it looks like the example. We start by thinking about the way we want our menus to work. Our program is going to be based on 3 functions. We will use the functions to alter the text that has been selected. Our Menus will be as follows. 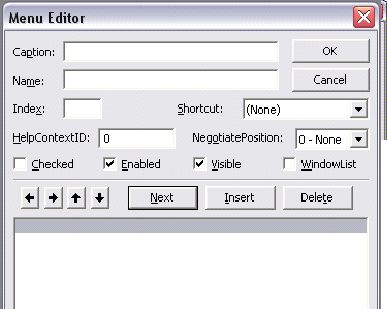 Visual Basic has a built-in Menu Editor. 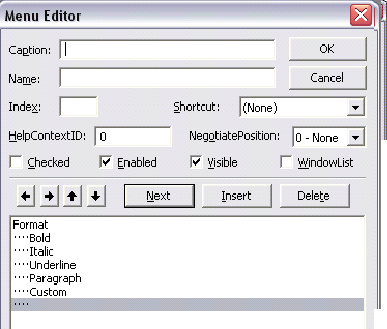 To access the menu editor, click on Tools, Menu Editor on the main menu. To create our first menu, type Format in the box labelled Caption. We also need to give this menu a name. Type mnuFormat in the Name box. Click on the Next button and you should see the new menu in the text box below. The grey shading will now appear underneath the word Format. To show that the next item is to be a part of this menu, click on the right arrow. For our first item in this menu, type the caption Bold and give this menu the name mnuFormatBold. If you have done this correctly, the menu editor should now look like this. To do our second menu, we need to click on the left arrow to show that the item that follows is a separate menu. For this menu, type the caption Lists and name the menu mnuLists. As before, click the right arrow to place the items that follow in the Lists menu. There are two items on this menu. Bullets, which has the name mnuListsBullets and Numbers which has the name mnuListsNumbers. When you have done this, click on the OK button to end the menu editing process. Check that the menus appear on your form as you would expect. Remember those 3 functions that our program was going to be based on. The Make A Tag function will be used to write tags for bold, italic, underline and paragraph tags. The Custom Tag function will allow the user to input the letter(s) in an HTML tag and have the selected text altered accordingly. The Make A List function will deal with the two different types of list in HTML. Click on View, Code on the menu and type in the following function definition. makeTag = "<" & strTag & ">" & strSelected & "</" & strTag & ">"
Look carefully at the first line. This function has two parameters, strSelected and strTag. strSelected represents the text in the text box that has been selected. strTag is the letter (eg b) that is used to make the tag. The Custom Tag function is as follows. customTag = "<" & strTag & ">" & strSelected & "</" & strTag & ">"
This time, the choice of tag letter comes from an inputbox. strTemp = "</li>" & vbNewLine & "<li>"
makeList = "<" & strTag & ">" & vbNewLine & "<li>" & strSelected & "</li>" & vbNewLine & "</" & strTag & ">"
A little bit more complicated this time. Now we have written the 3 functions, we need to make sure that clicking on the menu, makes the right thing happen. To bring up the event procedure for the menu, you simply click on the item that you want to program. To begin, click on Format, Bold on the menu on your form. You should see the following lines of code. We need to call our makeTag function and send it the relevant information. Alter this code to read as follows. This program is only the beginning of something useful. Web designers often use expensive software to help them write their pages but even the most complete package misses out one or two things. Many things are missing from this sample. For example, being able to load and save whole web pages rather than work with snippets of code would be a useful feature.